We are pleased to announce that Why R? 2018 Conference will be organized by STWUR (Wroclaw R Users Group). 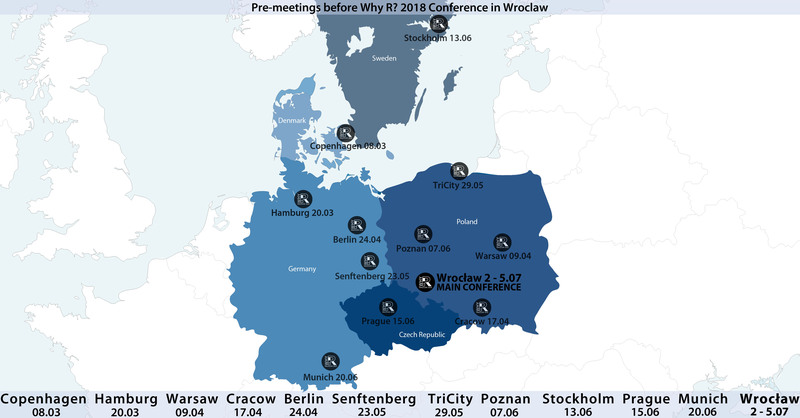 The second official meeting of Polish R enthusiasts will be held in Wroclaw 2-5 July 2018. As the meeting is held in English, we are happy to invite R users from other countries. We are on Facebook and Twitter. Check us out and invite your friends to the event! The registration fee includes participation in workshops and Special Interest Groups. Continuous coffee breaks and lunches on the 3rd and 4th of July are covered by the fee. Refunds are possible till 01.06.2018. Abstract submissions are format free, but please do not exceed 400 words and state clearly a chosen call. The abstract submission form is available here or during the registration. HydroProg | Head of the Department of Geoinformatics and Cartography at the University of Wroclaw. Head of Polish Language Institute, Polish Academy of Sciences (PAN). Simulation of dynamic models in R | Senior Scientist, Faculty of Environmental Sciences. A professor for Computational Statistics at the Department of Statistics at the LMU Munich. Immunoinformatics and Machine Learning, DTU Bioinformatics Employees. 2nd of July: R workshops. Additional mlr workshops are on July the 3rd. The list of workshops is already available. July the 3rd and 4th: plenary lectures (30 minutes including questions) and talks (15 minutes including questions) submitted by WhyR participants. July the 5th: hackathon, a collaborative work on the mlr package under the guidance of its developers. July the 5th: spontaneously formed discussion groups. We provide rooms, continous supply of coffee and snacks. You provide topics and enthusiasm. July the 3rd and 4th: two dynamic sessions of short talks (around 5 minutes - no questions). July the 5th: meet R users with similar interests and share with them your experience. Topics: Diversity in Data Science, Career-planning in Data Science and Teaching data analysis. With 10 versatile meeting and conference rooms, state-of-the-art meeting technology and individual conference menus, we can organise your event exactly as you want it to be. After your meeting or a bit of sightseeing, visit our restaurant and bar “My Corner” where you can try local specialities. You can also opt for a workout in our gym, followed by a relaxing moment in the sauna. At the end of the day, enjoy a pleasant night’s sleep in our rooms, done up in classic or modern Scandinavian design. Scandic Wroclaw is close to tons of popular sights, cosy cafés, theatres, the opera and philharmonic. We offer the perfect starting point for exploring the fascinating labyrinth of bridges and islands that make up this city. In just 10 minutes, you are at the market square in the historical old town or at the train station. Don’t miss out on the Africarium, a complex within Wroclaw Zoo that is unique in the world, dedicated to water-based African species and ecosystems. The airport is only a 30-minute drive away. This board aims to inspire members of affinity groups to pursue careers in data science. We hope that this platform for networking and exchange of experiences will help in boosting diversity of R community. This meeting is moderated by R-Ladies Warsaw. During this meeting, participants of WhyR will have a chance to learn from more experienced R enthusiasts about their career paths. This meeting will be moderated by Artur Suchwałko (QuantUp). Data science, as every emerging field, requires constantly evolving set of skills. In any setting, both corporate and academic, teaching data analysis remains a challenge. During this meeting data science practitioners will share their experiences in introducing their students to basic and advanced concepts of data science. This meeting will be moderated by Leon Eyrich Jessen (Technical University of Denmark) and Stefan Rödiger (Brandenburg Technical University Cottbus-Senftenberg).